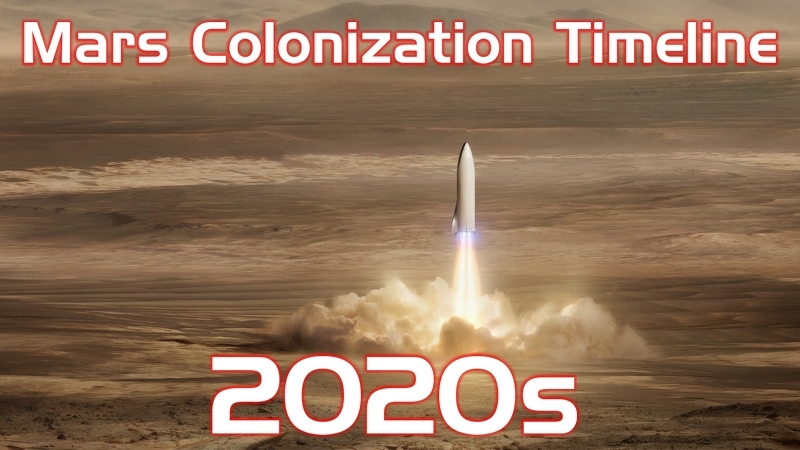 Inspired from FutureTimeline.net and the Integrated Space Plan we have created a speculated timeline of human exploration and colonization of Mars. Predictions are based on a reasonably optimistic evaluation of technological and social progress of humanity. Only the most important and innovative events are mentioned. Timeline is regularly updated taking into account latest developments. Last update was made on 15th April, 2019. 2016 – Elon Musk reveals SpaceX plans for the Interplanetary Transport System (ITS, formerly known as Mars Colonial Transporter). 2016 – ESA&Roscosmos's ExoMars Trace Gas Orbiter enters Mars orbit, but Schiaparelli lander crashes on the surface of Mars. 2017 – Elon Musk updates SpaceX vision "to make life multiplanetary" and colonize Mars (with Big Falcon Rocket architecture, formerly known as Interplanetary Transport System). 2018 – NASA's InSight lander lands on Mars at Elysium Planitia. 2019 – First test hops of SpaceX's Starship (formerly known as Big Falcon Rocket) test vehicle – the Starhopper. 2019 – NASA awards several companies, including SpaceX, Blue Origin and Lockheed Martin, with contracts to develop and build landing system (consisting of one or several vehicles) capable to land on the Moon and bring back to Lunar Orbital Gateway at least 2 astronauts no later than 2024. 2020 – SpaceX's prototype Starship reaches the boundary of outer space for the first time. 2021 – ESA&Roscosmos's ExoMars rover lands on Mars at Oxia Planum. 2021 – NASA's Mars 2020 rover lands on Mars in Jazero Crater (Western Isidis Planitia) to collect samples for later retrieval. A small reconnaissance drone-helicopter accompanies the rover. 2021 – First Chinese orbiter, lander and rover reaches Mars. 2021 – United Arab Emirates Hope probe enters Mars orbit. 2022 – SpaceX's prototype booster (Super Heavy) and cargo Starship makes first full-fledged orbital test flight around Earth. 2023 – India's Mangalyaan 2 orbiter and lander reaches Mars. 2024 – First SpaceX's crew Starship successfully tested on orbital flight. 2025 – SpaceX's uncrewed cargo Starship lands on the rim of the Shackleton Crater near the lunar South pole. 2025 – Japan's Martian Moons Explorer lands on Phobos to collect samples and return them to Earth in 2029. 2025 – Core structure of international Lunar Orbital Gateway completed in Lunar orbit. 2025 – Blue Origin's and Lockheed Martin's uncrewed human landers land near the Shackleton Crater (the Moon). 2026 – A communications relay satellite is placed at Sun-Earth Lagrangian point L5 to overcome the problem of periodic communications blackout with spacecrafts temporary behind the Sun. 2026 – Humans return to the Moon as Blue Origin's and Lockheed Martin's crew landers land on the rim of the Shackleton Crater near the lunar South pole. First woman on the Moon. 2026 – SpaceX's crew Starship #dearMoon flies around the Moon with Yusaku Maezawa and 8 artist on board. 2027 – Two demonstration cargo Starships separately land on Mars at the two most promising locations for the first human base on Mars; both ships have a small nuclear power reactor in cargo and an automatic atmospheric propellant plant to produce oxygen and methane from Martian atmosphere. 2027 – SpaceX's crew Starship lands on the rim of the Shackleton Crater to establish the first human outpost on the Moon. For the time being it's only temporary inhabited. 2027 – NASA&ESA's sample return orbiter (with broadband laser communications capability) and lander (with Mars ascent vehicle and a sample collection rover) reaches Mars to retrieve samples collected by Mars 2020 rover and launch them back to Earth. 2028 – After the ground tests are done in both places the final location of future "Mars Base Alpha" is selected. Filled with local propellant the one Starship not on the selected location launches from Mars and successfully lands back on Earth the next year. 2029 – Two unmanned Starships land at the selected location of Mars Base Alpha: a backup crew ship (which has tested the Environmental Control and Life Support System (ECLSS) on the way) and a cargo ship with rovers, miner/tunneling droids and solar panels for the first human mission. 2030 – Several landing fields cleared and prepared robotically at Mars Base Alpha location for the human mission next year. 2030 – Human outpost on the rim of the Shackleton Crater near the lunar South pole, now called the Moon Village, permanently inhabited. China joins the Moon Village adding its modules and structures. 2031 – On a mission supported by NASA two SpaceX's crew Starships with 12 astronauts each land at Mars Base Alpha – first humans on Mars. The crewed ships (serving as temporary habitats) are accompanied with a few cargo ships, including one with machinery for a ground-based In Situ Resource Utilization (ISRU) system. 2031 – Chinese sample return lander and rover lands on Mars to collect samples and launch them back to Earth. 2031 – Solar array is built at Mars Base Alpha to supplement the energy generated by nuclear reactor on-board the first cargo Starship. 2032 – After the best location is confirmed a small-scale mining of water ice starts near the Mars Base Alpha. Ground-based ISRU system with atmosphere separator and chemical/propellant plant capable to produce and store water, nitrogen, argon and liquid methane and oxygen is assembled. 2032 – Several landing/launch pads for future Starship missions are built a few miles from Mars Base Alpha. 2033 – All of the landed cargo Starships, except the first one with nuclear power reactor and atmospheric propellant plant on-board, launch back to Earth unmanned. Crew spaceships stay on Mars. 2033 – NASA's research Mars Surface Field Station is established at Mars Base Alpha. 2034 – Small-scale Martian soil extraction, chemical separation and storage equipment is assembled; the useful elements now can be used in the greenhouse and ISRU system. 2034 – Several space agencies join NASA in financing the scientific operations at Mars Base Alpha and transport of their scientists between Earth and Mars. 2035 – First fully occupied Starship with 50 scientists, workers and colonists lands at Mars Base Alpha. 2035 – NASA's Mars Surface Field Station is reorganized into an international scientific research base with scientist crews rotating every Earth-Mars synod (26 months). 2036 – First orbital fuel depot for hydrolox and methalox rocket engines completed at Low Earth orbit. The hydrogen, methane and oxygen is provided from the Moon and Near Earth asteroids. 2036 – The ISRU capabilities of Mars Base Alpha are extended not only to produce air, water and methalox fuel, but also steel, bricks, cement, basic fertilizers, plastics and silica products (as glass panels). Some industrial size 3D printers are also assembled. 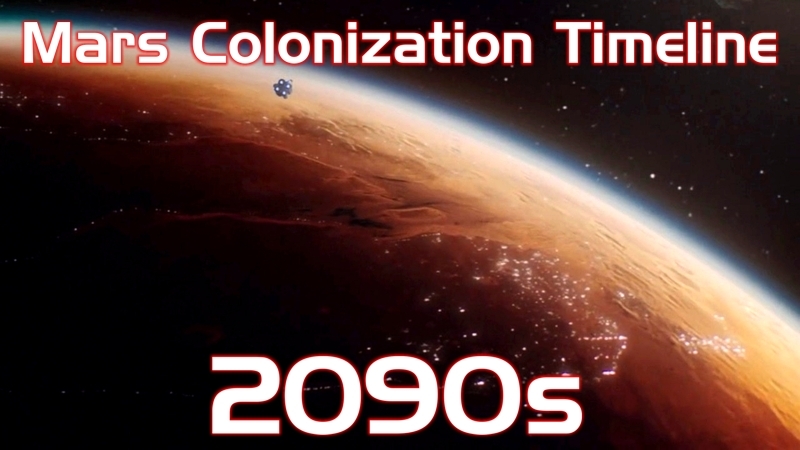 2037 – Starships with 100 human colonists and workers lands at Mars Base Alpha, which now reaches a population of 200. Cargo Starships bring in heavy duty construction and tunneling equipment. 2037 – A constellation of satellites with global positioning system (GPS) and global communications system is placed in orbit around Mars by cargo Starship. Now it's hard to get lost on Mars; possibly only in a lava tube or a narrow canyon. 2038 – Cyanobacteria is introduced into the ISRU processes of Mars Base Alpha. 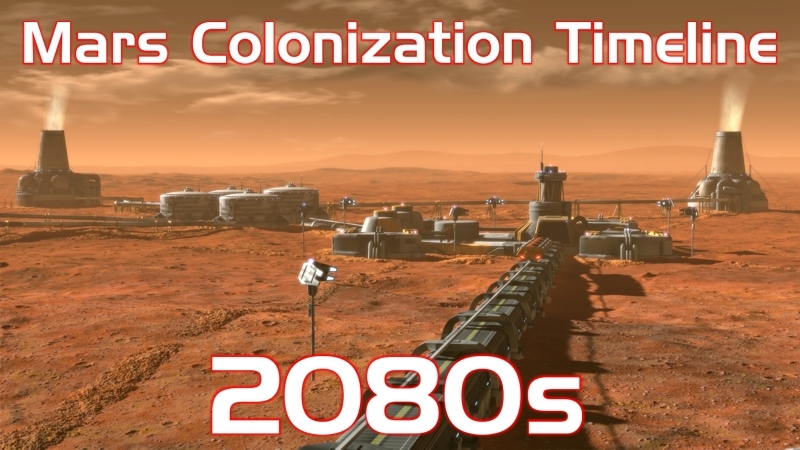 2038 – A fish farm is built at Mars Base Alpha to provide more diverse local food for the colonists. The greenhouse is vastly expanded. 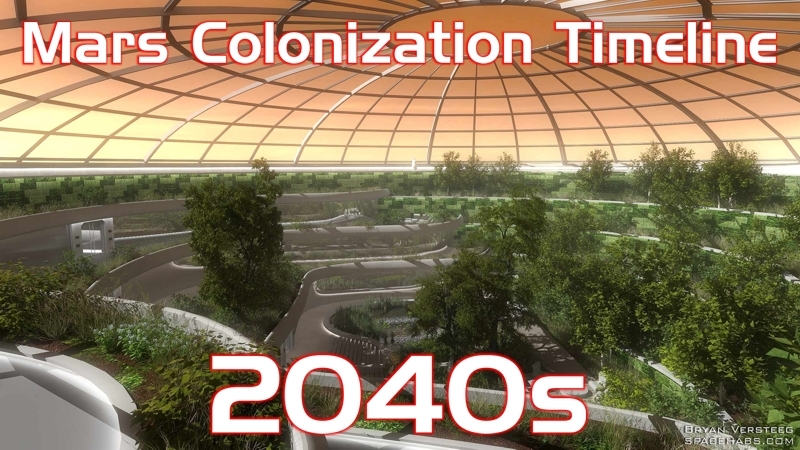 2039 – A transparent, radiation-filtering geodesic dome with garden is built at Mars Base Alpha; work begins to build a new underground section with larger habitats and working areas to boost the population capacity of the base to 1000. 2039 – First child is born on Mars at Mars Base Alpha. His voyage to Earth later in his life would be dangerous because of his bones and organs not being fit for Earth's gravity. 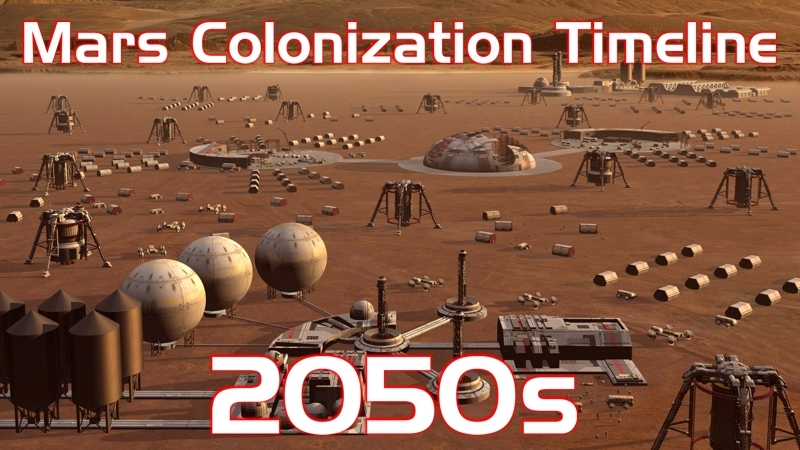 2040 – Starships with 200 human colonists, workers and individual wealthy tourists land at Mars Base Alpha. 2040 – The new underground section of Mars Base Alpha is finished. Now the colonists have a lot spacier living and working quarters with full radiation protection. 2041 – Cultured meat "farm" is built at Mars Base Alpha, adding meat (although artificial) to the diet of the colonists. 2041 – Virgin Galactic establishes the first luxury hotel at the outskirts of Mars Base Alpha. 2042 – Starships with 200 passengers land at Mars Base Alpha, which now has a population of more than 500. 2042 – On behalf of several space agencies and asteroid mining companies Blue Origin's manned spaceship reaches Mars orbit near Phobos with first modules for Free Spaceport of Phobos project which will be a space station with several spinning sections with Mars-level artificial gravity of 0.38g and serve as a way station and fuel&repairs depot for manned and unmanned spaceships heading for Mars, Main asteroid belt and beyond. 2042 – First expedition to the summit of Olympus Mons – the tallest planetary mountain in the Solar System. 2042 – International human mission to Phobos and Deimos, operated by Blue Origin from Free Spaceport of Phobos construction place. 2043 – Several small proxy bases for scientific, mining and other purposes are established within a few tens of miles from Mars Base Alpha. 2043 – First mass driver constructed on the Moon at Moon Village to launch harvested & processed oxygen, hydrogen and methane for storage at Lunar Orbital Gateway and fuel depot at Low Earth orbit. 2044 – First BFR Heavy Starships with 300 passengers land at Mars Base Alpha. Among them is SpaceX's founder Elon Musk. BFR Heavy is an enlarged and upgraded version of BFR with a 15m core booster and a Starship with spin artificial gravity of 0.38g and spacier living quarters for up to 100 passengers. 2045 – Large deposit of minerals with high concentration of rare metals is discovered a few hundred miles from Mars Base Alpha. A research Mining Base Beta is established. 2045 – Robotic water ice mining station is built on Phobos to supply the water and propellant needs of nearby Free Spaceport of Phobos. 2045 – A land trip all around the Mars is completed for the 1st time. 2046 – Heavy Starships with 400 passengers land at Mars Base Alpha bringing parts for a nuclear fusion reactor as well. 2046 – With additional modules arriving and maintained by Blue Origin the international Free Spaceport of Phobos is now operational. Robotic asteroid mining in Main asteroid belt now can rapidly expand. 2046 – Blue Origin's lander lands on Mars for a scouting mission to confirm the best location for Blue Mars base. 2047 – The landing pads a few miles from Mars Base Alpha where crew and cargo Starships has landed and taken off for two decades are transformed into a small spaceport with pressurized skybridges for both passengers and cargo. 2047 – A public transport route between Mars Base Alpha and Mining Base Beta is established. 2048 – A short hyperloop line from Mars Base Alpha to its spaceport is finished. 2048 – Several Heavy Starships with 400 passengers land at Mars Base Alpha and another one with 100 (mostly miners) at the Mining Base Beta. The population of the Mars Base Alpha now surpasses 1200 with 200 more colonists living at nearby proxy bases and 200 at Mining Base Beta. 2048 – Blue Origin's spaceship fleet with 100 workers arrives at Free Spaceport of Phobos; workers are shuttled down to establish the Blue Mars base about thousand miles from Mars Base Alpha. 2049 – A nuclear fusion power station is operational at Mars Base Alpha. 2049 – A new underground section of Mars Base Alpha is finished, boosting its population capacity to 3000. 2050 – With increased electrical power the ISRU and industrial capabilities of Mars Base Alpha are greatly extended, using the resources harvested, refined & processed around Mars Base Alpha and nearby proxy bases. Solar panel assembly factory is the first factory on Mars manufacturing complex products. 2050 – Mars police force established taking over the policing function on Mars from security guards hired by SpaceX. 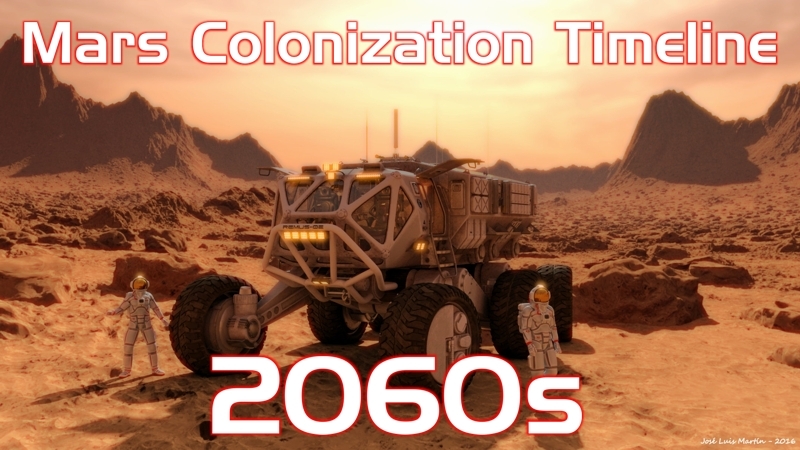 2050 – Earth and Mars is the closest since the beginning of the colonization. The largest colonial fleet ever arrives at Mars with 1000 colonists landing at Mars Base Alpha, 200 at Mining Base Beta and 100 at Blue Mars base. 2051 – Mass driver at human base in Sea of Tranquility on the Moon constructed to launch harvested helium-3 for usage in fusion power plants. 2051 – With China and Russia focusing on the Moon, India is the first Asian superpower to establish its own base on Mars. 2052 – International human mission to Ceres (flying with a new generation nuclear fusion spaceship) stops at Free Spaceport of Phobos to resupply, drop some scientists at Mars Base Alpha and take additional crew members from Mars. 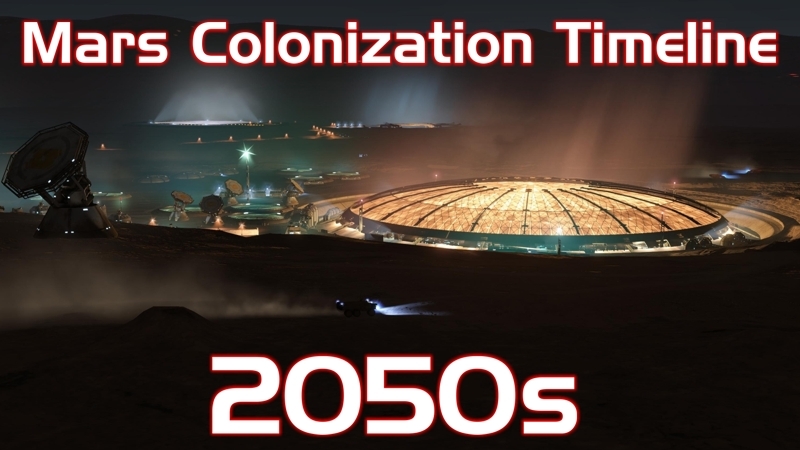 2053 – 1500 colonists land at Mars Base Alpha and Mining Base Beta and 150 at Blue Mars base. There are now more than 4000 humans permanently or temporarily living on the surface of Mars. 2053 – At an impact crater near the Mars Base Alpha work begins to build the first large-scale dome on Mars, covering the entire crater more than a mile across. 2054 – A deuterium separation facility becomes operational at Mars Base Alpha to supply the needs of nuclear fusion power plants and other applications. 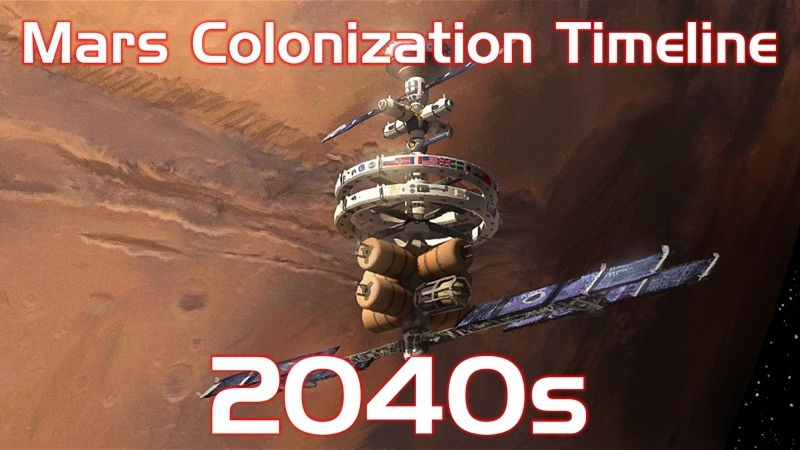 2055 – As more colonists land at Mars Base Alpha it reaches its maximum population capacity. More habitats are built at the outskirts of Mars Base Alpha, at its proxy bases and Mining Base Beta to support the influx of colonists. 2055 – Several more Blue Origin's shuttles land at Blue Mars base, boosting its population to more than 500. 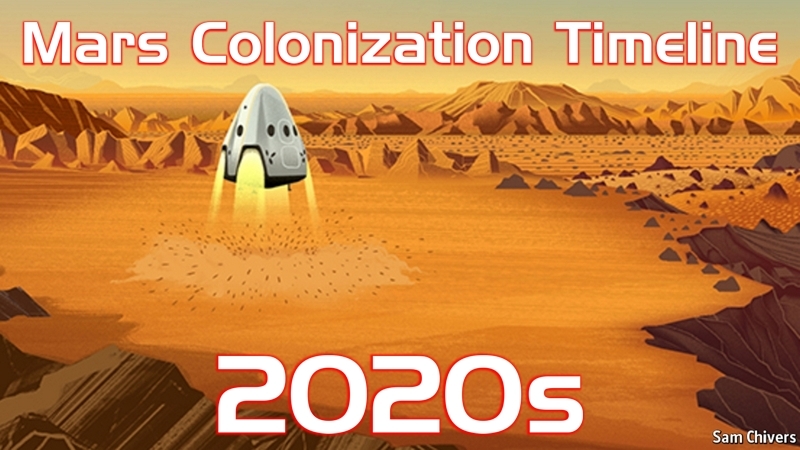 Indian Mars colony now has more than 200. 2055 – Using its strong presence on the Moon in its favor, China establishes its own colony on Mars which now is being expanded fast. 2055 – A modest defense system is built consisting of ground tracking stations and satellites in orbit around Mars armed with missiles and lasers to destroy those incoming meteoroids whose trajectories pose a threat to human bases on Mars. 2056 – The rover repair depot at Mars Base Alpha is upgraded to a Tesla rover factory. 2056 – A public transport route between Mars Base Alpha and Blue Mars base is established. 2056 – The large-scale transparent, radiation-filtering, light-weight dome is finished and pressurized near Mars Base Alpha, covering an area of almost a square mile; workers move in now to construct the buildings and gardens (with such features as artificial waterfalls) below the dome. Mars Base Alpha, the new dome and several closest proxy bases are combined under the name "Mars City". 2057 – The new generation of SpaceX's nuclear fusion powered spaceships arrive at the Free Spaceport of Phobos; passengers are shuttled down to the spaceports of Mars City and Mining Base Beta. The BFR family Starships are retired from SpaceX fleet after 32 years of successful service and sold to several interested countries and companies. 2058 – The interior infrastructure of Mars City's dome is finished, having a maximum population capacity of 20'000. 2058 – A hyperloop line and heavy cargo train tracks are built between the Mars City and the industrial complex at Mining Base Beta. 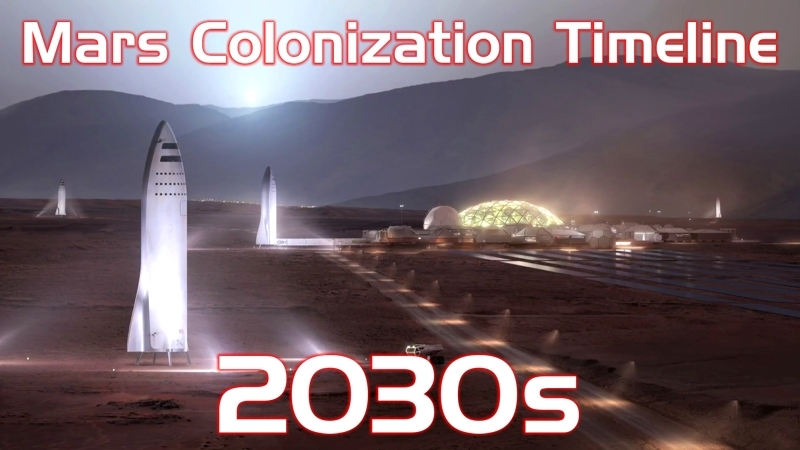 2059 – SpaceX's nuclear spaceships take more colonists to Mars City, bringing its population to 7000. 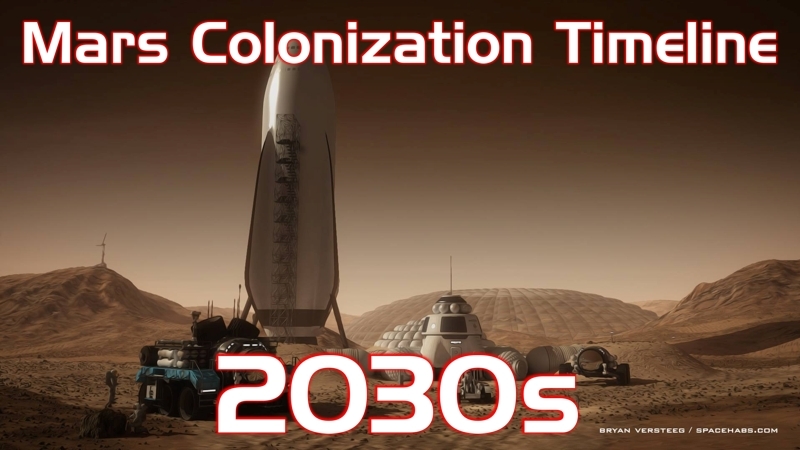 2059 – First Brazilian Heavy Starship lands at Mars City. One of nearby proxy bases is sold to Brazil and expanded with more living habitats. 2059 – United Arab Emirates establishes its first base on Mars – the New Dubai. ■ Mars City's population reaches the level you can't anymore made the decisions by corporate hierarchy or direct democracy only. First city council on Mars is elected. ■ The expanded Free Spaceport of Phobos more and more serves as a space logistics hub not only for colonies on Mars but for mining activities in Main asteroid belt as well. Several more space-faring nations begin participating in the spaceport project. ■ Several more orbital space stations are completed around Mars for in-space manufacturing, tourism and other purposes. ■ First humans born on Mars travel to Earth using exoskeletons as body-support because of Earths heavier gravity. ■ Commercial companies from various nations open their branches and operations on Mars. ■ Tourism from Earth is expanding on Mars. Although the trip is still expensive and only the rich can afford it. Besides its high-tech cities and bases Mars can offer spectacular safari rides and if you are really wealthy you can hire some of the guides to take you to the caldera of Olympus Mons, depths of Valles Marineris or other exclusive locations. ■ A second large-scale dome on Mars is constructed at Blue Mars. A hyperloop line is built between Mars City and Blue Mars. ■ First measures to start the terraforming process of Mars are made, powdering Martian polar ice caps with black lichen to reduce their albedo and melt the ice and building small automatic halocarbon factories throughout Mars to produce and release super-greenhouse gases in Martian atmosphere. ■ Artificial magnetic field generator is placed at Sun-Mars Lagrangian point L1 to shield Mars from solar radiation with the generated magnetotail and help the terraformation process of the planet. ■ Free Spaceport of Phobos is the starting point for international human mission to Galilean moons of Jupiter. ■ Nuclear fusion powered spaceships (greatly reducing the travel time from Earth and widening the launch window) bring more colonists to Mars than ever before. In 2060s the human population on Mars explodes from less than 10'000 to more than 50'000 with Mars City alone having 25'000. ■ The Free Spaceport of Phobos is the main supply node for human outposts and missions to Ceres, asteroids in Main asteroid belt and Galilean moons of Jupiter. ■ Cyanobacteria and methanogens are spread in lower regions of Mars to further increase the terraformation process. ■ The old workhorse of human colonization of Mars – the BFR family Starships are finally retired completely. The oldest of them are 50 years old now. ■ Mars City is expanded with two more domes of similar size and several smaller ones. ■ There are 5 cities with large-scale domes now on Mars. All of them are interlinked with hyperloop lines. ■ The cluster of Indian colonies on Mars is starting to specialize on growing food for human space outposts in Main asteroid belt and beyond, as Mars is the closest object to them with substantial gravity and natural sunlight for growing crops relatively cheaply. ■ The Free Spaceport of Phobos is a starting point for international human mission to the moons of Saturn (Titan, Enceladus and other). ■ Now almost all of the space-faring nations are represented on Mars with a base, a city block or a corporate enterprise. 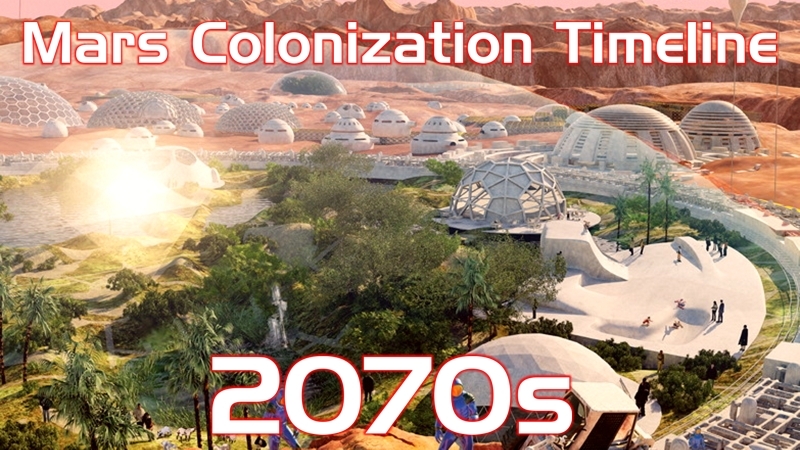 ■ In 2070s the human population on Mars expands from 50'000 to 200'000 with the largest colony – Mars City – having 60'000. Four more cities have a population of more than 15'000. ■ First Martian Council, consisting of proportionally drawn representatives from every Martian city and base, is assembled on the principle of self-government. The Council deals with the issues important for all of the Martians (as ongoing terraformation initiatives or building a space elevator) and acts as a representative of the Martian population in relations with the corporations and governments of Earth. ■ As space elevators first on the Moon and then on Earth become operational, the cost of launching any mass to Mars and elsewhere into space is slashed considerably, greatly speeding up the use of space resources and space colonization. ■ Almost all colonists have left the oldest sections of former Mars Base Alpha with its obsolete infrastructure; the area is declared now a national heritage site, preserving the 1st human base on Mars as it was in the late 2040s and acting as a tourist attraction. ■ Tourism from Earth is becoming more and more mainstream. Now even a middle-class people can afford a trip to Mars. ■ Despite criticism China builds the first prison on Mars. Soon other colonies are quietly sending there their criminals too. ■ More powerful halocarbon factories are set up throughout Mars. The bacterial and lichen coverage around Martian surface is further increased. ■ Connected base stations for downward and outward space elevators on Phobos are built; work begins to construct both space elevators. The downward elevator will cut short of the upper edge of Mars's atmosphere with a shuttle platform at its tip. The outward elevator will have several platforms at different points to catch and release payloads (including spaceships) to Earth's system, to Main asteroid belt and to Jupiter's system. ■ Work begins to build a large shuttle port at the summit of the Martian volcano practically on the equator – Pavonis Mons – for shuttles heading to and coming from Phobos space elevator. ■ In 2080s the human population on Mars expands from 200'000 to 500'000 with the largest of the Martian cities – Mars City – surging past 150'000 inhabitants. 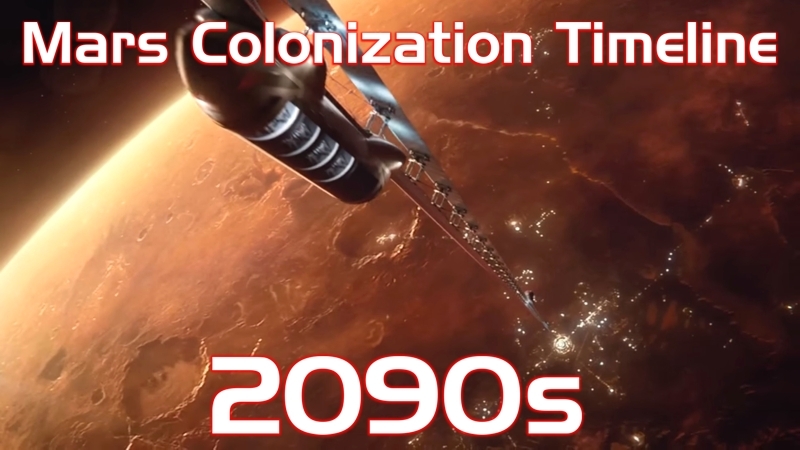 Particularly large colonial fleet arrives on 2082 when Earth and Mars is the closest since 2003, only 55.9 million kilometers (34.7 million miles) apart. ■ The Phobos space elevator system is finished, greatly speeding up the colonization of Mars, interplanetary trade and the growth of human outposts in Main asteroid belt and Galilean moons of Jupiter. ■ The shuttle port at the summit of Pavonis Mons quickly expands into one of the largest human colonies on Mars – Pavonis City, which is soon connected with other major Martian cities by hyperloop lines. ■ Establishment of Pavonis City greatly expands tourism in some of the most spectacular Martian regions nearby – Tharsis Montes, Olympus Mons, Noctis Labyrinthus and Valles Marineris. Tourist bases and hotels are popping up there fast. One of the hyperloop lines runs through all the length of Valles Marineris. 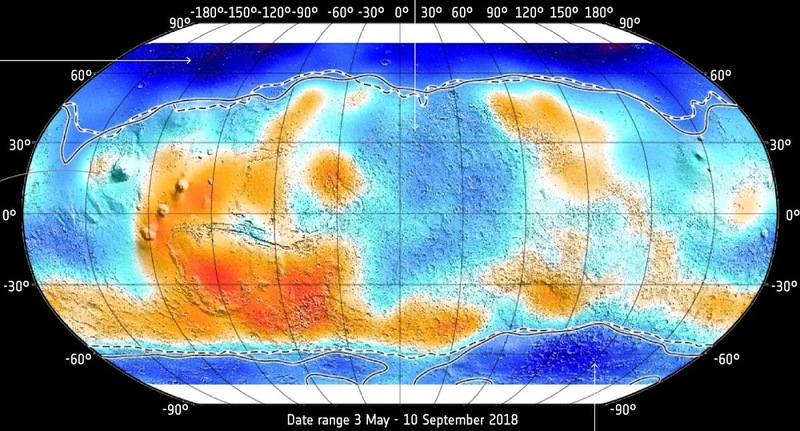 ■ In an anticipation of air pressure and temperature increase, new human colonies are being set up mainly in the lower regions of Mars, particularly Hellas Planitia and Valles Marineris, where the results of terraformation activities will be felt first. ■ In 2090s the human population on Mars reaches 1 million. Finally Elon Musk's goal to put 1 million people on Mars is reached. ■ Mars becomes practically self-sufficient, having to import only the most complex goods and intellectual property. 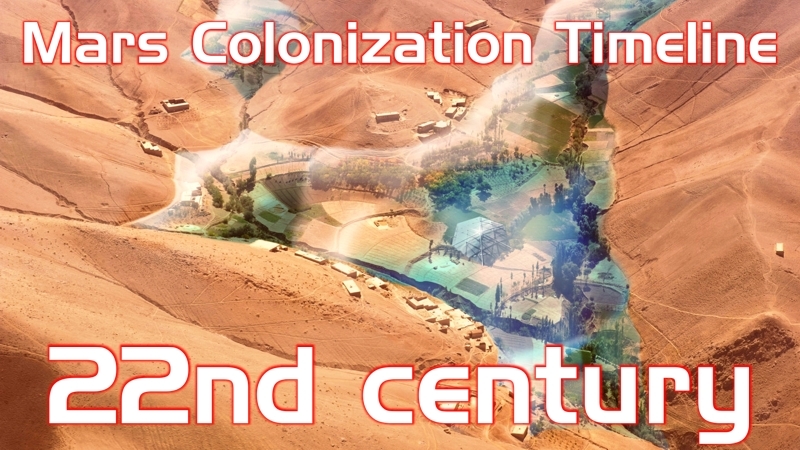 ■ The self-sufficiency results in Mars becoming an independent nation-state. The Martian government has to buy up the non-Martian governmental assets located on Mars. ■ As a technologically advanced frontier society Mars and orbital stations around it become the primary source of specialists and workers needed for human bases and missions further in Main asteroid belt and outer Solar system. ■ Air pressure and temperature on Mars is increased to the level where there is flowing water on the surface and simple plants can be introduced into newly created biosphere of the planet. ■ As one of the lower regions on Mars close to the equator Valles Marineris is seeing the most benefits from terraformation activities and Phobos space elevator; cities and farming communities are spreading throughout the valleys and at the end of the 22nd century there are nearly 5 million people living in Valles Marineris. It's the most populous urban area on Mars. ■ In the 22nd century the total human population on Mars increases 30-fold – to more than 30 million. Your series of articles about the Phobos tethers is really great! Thanks for sharing! great minds think alike. there are many similarities in both, your timeline and my book, "Journals from Mars". Good job!!! Would be interesting to read. Where it can be attained? I want to go on mars please take me in your team. I would think that by the 22nd century, we would have terraformed mars outside of out dome things. Not a good timeline in my opinion. I really liked your article. Can I make a translation into another language? And post it on your website? If you please. You can, but the timeline is constantly changing. You can post it on your page but insert a link to this original. Hope nobody brings religion and mosquitoes to Mars.